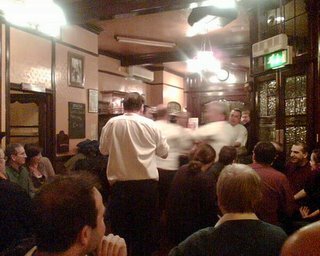 A mixed night on Friday - TCMJ and I went back to Smithfield, for a Trafficlink leaving do, at the Rising Sun, on Cloth Fair. This is a good, back to basics, no-nonsense boozer - and it's a Sam Smiths pub too, so the bitter is good and although the lagers may be a bit chemically, at these prices, who cares! There's darts there too, which The American Eric Pradel and I have been known to participate in from time to time, usually with disasterous results. Other than our feeble attempts, the darts there appears to be pretty serious, as a poster proclaimed that a man I now know to be Andy "The Viking" Fordham, the 2004 World Darts Champion, is appearing there soon. "The Viking", appearing at a pub near you soon. Anyway, around the middle of the evening, we noticed that a man in a kilt was at the bar. This being London, nobody raised an eyebrow except for the obvious comment of "man in a skirt!" (albeit not too loudly, as he looked quite tough) and we carried on drinking. Then suddenly there were five others, and a full sword-dance broke out, in a space not much bigger than a pub table. Three minutes of whirling and waving, a collection - I think the man mentioned when he came round that it was an English rather than scottish traditional version - and it was all over. Has anyone else seen these men? TCMJ remarked afterwards that this was why she liked London pubs - you never know quite what's going to happen. 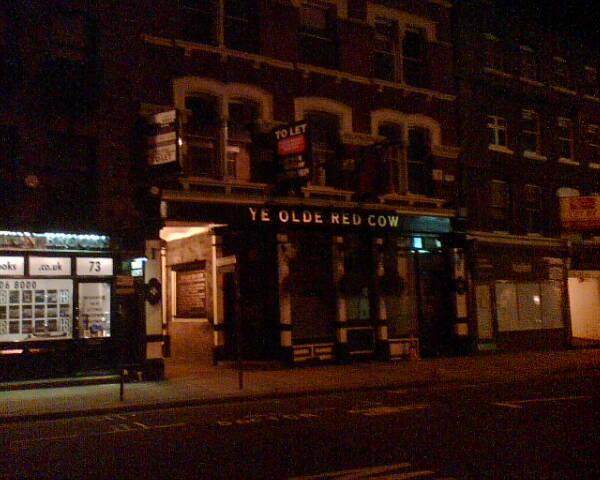 Sadly, this was as we walked past the Olde Red Cow, which is now "dark", as I believe the theatre term goes. This was possibly my favourite of the Smithfield circuit; the most civilised and least crowded (perhaps why it's closed!) of the bunch, and better for those reasons than the other Shepherd Neame pub nearby, the Bishop's Finger. If I still worked round there, I'd miss it. 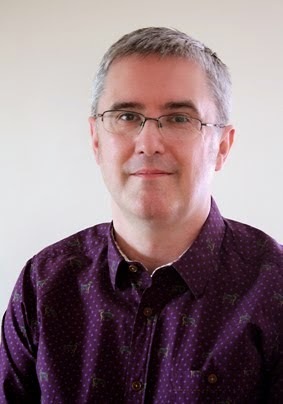 For the first time in nearly 100 years, I'm posting some new pubs. 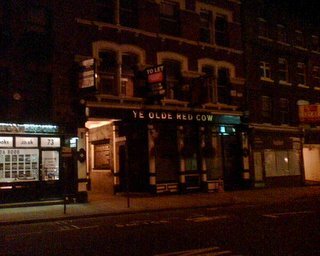 First up, as we say on the radio, Al and I tried to do a Northern line pub crawl. Except the Northern line wasn't working. We had grand plans to visit a new pub (well, new to us) in London's glamorous SW17, then move on to South Wimbledon, and ended up getting as far as our first pub in Kennington before being diverted to Stockwell. So here goes. Our first pub was known to Al but not to me - he used to walk past it to get to Lambeth County Court - not, I hasten to add, to appear, but in work-related duties of course. Cast aside your drive-by shooting led preconceptions of Kennington... this is a gentrified square within the sound of the Division Bell and is therefore home to MPs and Kevin Spacey (this is where he really lives, not the Penthouse above the Old Vic that I described to an old lady in a Stella-fuelled Pit Bar incident). The Prince of Wales is a perfectly nice, upmarket local pub - with a mix of toffs, Sarf Londoners and students from Lambeth Art College. It sells Shepherd Neame beer and its location is great, but that's it really - and again, it was very smokey. When I took a flash photo outside, the curtains twitched... it's that sort of place. So we moved on, aiming for the Little House, Tooting. For some reason, despite having lived in the area for five years, I had shoddily overlooked this place, allegedly a nice local boozer. But then someone was "taken ill on a train at Balham" and the tube ground to a halt. Bang goes the Little House, and the Sultan in South Wimbledon then. So we got off the train and headed to an old favourite, the Priory Arms on Lansdowne Way in Stockwell. When I lived in SW8, this was my local. I thought I was lucky then, and nothing's changed. Great beers (keen to support local brewers, I had a pint of Seaforth Ale, from the Hebridean Brewing Company and Al had some smoked bottled beer), friendly clientele and they sell proper pork scratchings from the West Midlands. Who could ask for more? And I guess that's why it's been the local CAMRA branch pub of the year many times. So a good outcome to the evening despite the tube problems. We'll just have to try again another day! And Wallis and I went to Soho on Thursday... no, it's not what you're thinking. Nick's already done The Ship, but an honorable mention should go to The Blue Posts on Berwick Street as well. Nick and I rolled up there in search of a pub to sit and talk in - and found two prime bar stools. Now, depending on your opinion, this could be because it was a horrid old man's pub in desparate need of a make-over; or because it's an oasis of traditional boozer in a sea of All Bar Ones. Regardless, it was the right pub, right now and I loved it. When they didn't call time at 2300, we thought we'd also found one of those new-fangled late licences, which would have made the place pefect. But it turns out that they, er, just hadn't called time, and it still closed at 11pm. The landlady said they'd applied for an extension, but Westminster council rejected almost all of them as "there were plenty of places to drink late already"... Sadly, my barstool wasn't one of them. This is a somewhat legendary pub. In fact, a review of it already exists somewhere on this pub guide, so I'm inclined to think it therefore makes history as the only pub to be reviewed twice on WPG. Good. It's a pub run and staffed by people who like music. In every other regard it's exactly the same as every other Soho gin palace. So, you go and you stand on your own, you leave on your own, you go home and you think - "Well, things can't be that bad, then." There's no juke box, the bar staff are in control. In 99.9% of cases this would be a terrible thing. Here, good taste is part of the job description. The only downside is that it is very smoky, but according to my colleague, Radio 1's political correspondant, Robin Brant, a smoking ban will be here in early 2007. Bring it on.